"It was spectacular. I was driving through when I spotted the big brown splodge,” he said. "A lot of people were really amazed by it, cars were slowing down and people were taking pictures of it." 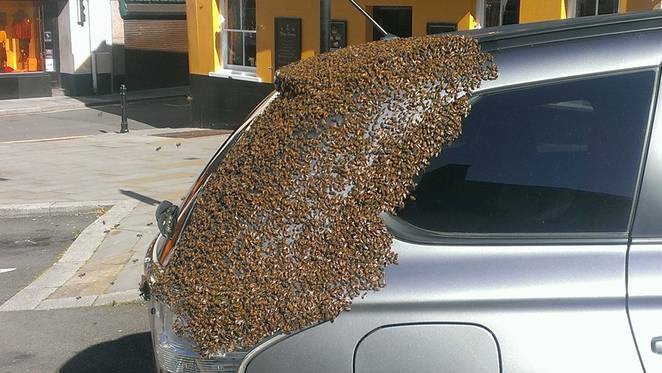 "I was a little bit concerned, with it being in the middle of town outside a pub, that someone might do something stupid and get hurt or do something stupid and hurt the bees," he said. 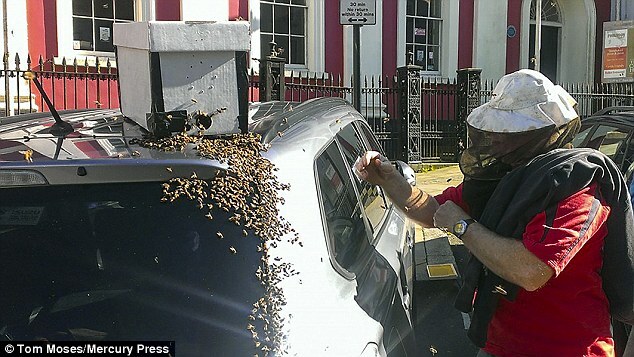 With the beekeepers on the job, by the time Howarth returned the situation appeared to be resolved. But, no. The swarm kept her in their sights and managed to track her down. Responses to "20,000 Bees Chased A Car For 2 Days To Rescue Their Queen Bee"
Very glad the rescue went well and that both humans and bees escaped without casualties. With the bee extinction crisis worldwide, every bee is precious. Most unusual situation. Thank you for sharing.